A thermal expansion kit consisting of a metal ball and a metal ring, both mounted on wooden handles is used to illustrate the idea that solids expand when heated and contract when cooled. Students should observe that the ball fits through the ring when both are at room temperature, but the ball does not fit through the ring when the ball is heated. Students should also observe that after the ball has cooled back down to room temperature, it fits through the ring again. Students need to infer that when the ball can no longer pass through the ring, it is because the ball has increased in size and that when the ball cools back to room temperature and can fit through the ring, the ball's size has decreased, even though it may look the same to the students. A second, unheated ball could be used to demonstrate that the ring has not changed in size. To appreciate that liquids expand when heated and contract when cooled, students are shown a round-bottom flask filled with coloured water and observe the level of water rising as the flask is heated and falling as the flask is cooled. Students need to infer that when the level rises, the liquid in the flask is expanding, and when the level falls, the liquid in the flask is contracting. Mylar balloon is filled with helium gas at room temperature and sealed. Mylar balloons work for this phenomenon because they do not stretch like rubber balloons. Students should observe that when the balloon is cooled, it looks deflated and when the balloon returns to room temperature, it looks inflated. Students must infer that the balloon looks deflated because the gas in it contracted when cooled and the balloon re-inflates when it returns to room temperature is because the gas in it expanded. The thermal expansion of gases is much more noticeable than solids and liquids. One liter of gas expands 34 mL for a temperature increase of 10ºC. An everyday example of thermal expansion can be seen in the kitchen. 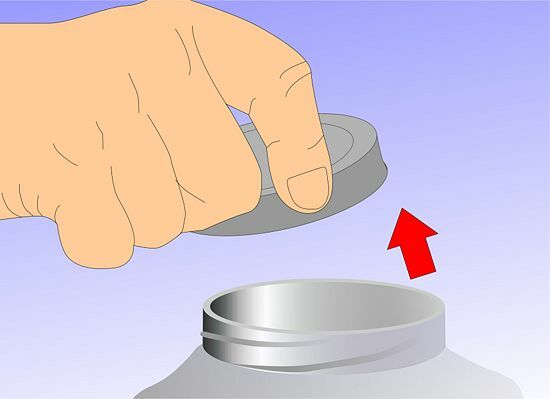 Almost everyone has had the experience of trying unsuccessfully to budge a tight metal lid on a glass container, and after running hot water over the lid, finding that it gives way and opens at last. The reason for this is that the high-temperature water causes the metal lid to expand. 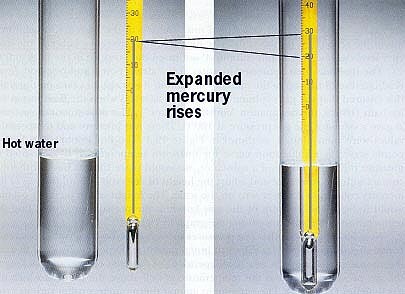 In a typical mercury thermometer, mercury is placed in a long, narrow sealed tube called a capillary. Because it expands at a much faster rate than the glass capillary, mercury rises and falls with the temperature. A thermometer is calibrated by measuring the difference in height between mercury at the freezing point of water, and mercury at the boiling point of water. The interval between these two points is then divided into equal increments in accordance with one of the well-known temperature scales. Most large bridges include expansion joints, which look rather like two metal combs facing one another, their teeth interlocking. When heat causes the bridge to expand during the sunlight hours of a hot day, the two sides of the expansion joint move toward one another; then, as the bridge cools down after dark, they begin gradually to retract. Thus the bridge has a built-in safety zone; otherwise, it would have no room for expansion or contraction in response to temperature changes. As for the use of the comb shape, this staggers the gap between the two sides of the expansion joint, thus minimizing the bump motorists experience as they drive over it. 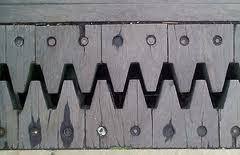 Most railroad tracks are built from pieces of steel supported by wooden ties, and laid with a gap between the ends. 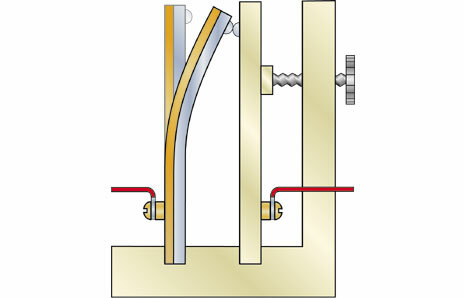 This gap provides a buffer for thermal expansion, but there is another matter to consider: the tracks are bolted to the wooden ties, and if the steel expands too much, it could pull out these bolts. Hence, instead of being placed in a hole the same size as the bolt, the bolts are fitted in slots, so that there is room for the track to slide in place slowly when the temperature rises. Another example of thermal expansion in a solid is the sagging of electrical power lines on a hot day. 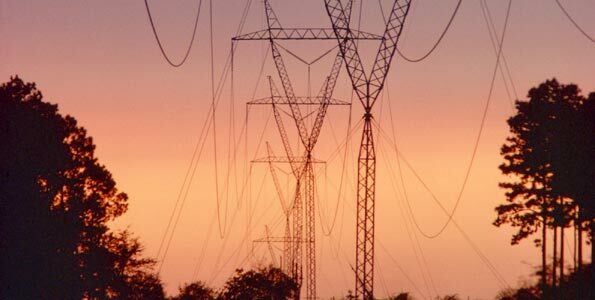 This happens because heat causes them to expand, and, thus, there is a greater length of power line extending from pole to pole than under lower temperature conditions. Diagram of a thermostat in an air-conditioning unit. A thermostat is used to regulate and maintain temperature. The bimetallic strip below bends according to the temperature, and becomes more bent as its heat increases. If it becomes so hot and bent that it touches the plate on the right, it completes an electric circuit, which turns the air-conditioning unit on. As the air-conditioning cools the surrounding air, the metallic strip also cools, causing it to straighten and break the circuit. If you heat a piece of ice at, say, -10°C, its temperature rises until it reaches 0°C and then remains constant until all the ice has melted. The temperature then starts to rise again.The energy supplied during the period when the temperature was constant is called latent heat. Latent heat is the 'hidden heat' used to change the state of a substance without a change in temperature.Latent heat means ‘hidden’ or concealed energy, in the sense that it does not show up on a thermometer. Usually, when a substance is heated, its temperature rises. However, when matter changes phase from solid to liquid, or liquid to gas, there is no actual temperature rise. The energy is used to overcome the forces of attraction, which hold the water molecules together in the solid state (ice) so that they become relatively free to move. Latent heat of fusion: The change of phase from solid to liquid. The specific latent heat of fusion of ice is 336 KJ kg –1.The specific latent heat of fusion of ice is the amount of heat required to change 1 kg of ice to water without a change in temperature. 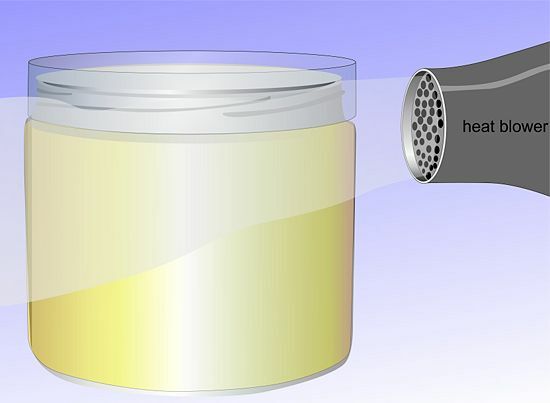 The specific latent heat of vaporisation of water is 2260 KJ kg –1.The specific latent heat of vaporisation of water is the amount of heat required to change 1 kg of water to steam without a change in temperature. There are two types of energy in a substance, which we often call to be the internal energy. The two types of energy are potential and kinetic energy. The kinetic energy is what defines the temperature of the substance. When the temperature of a substance reaches a state where it is ready to go through boiling/melting, energy is still being transferred but the temperature is still constant. In this process, bonds are being broken/formed, so energy transfer is definitely required for this change in state. However, if the kinetic energy doesn’t change here, what changes? The potential energy increases. One difference between boiling and evaporation is that evaporation happens at the surface of a liquid where boiling occurs inside the body of the liquid. Additionally, evaporation can literally happen at any temperature, as long there is enough Kinetic Energy to break bonds, but boiling can only happen at certain temperatures, e.g. 100°C for water. Condensation: This is the change of the physical state of matter from a gas into a liquid. Basically, condensation starts by the formation of atomic clusters of the substance in its gaseous (gas) state, like the formation of a rain drop in the clouds. Solidification: This is the change of the physical state of matter from a liquid to a solid.